Being Right Here: A Dzogchen Treasure Text of Nuden Dorje entitled The Mirror of Clear Meaning, with commentary by James Low. "James Low has made an invaluable contribution to Dzogchen studies with his excellent translation and commentary on this precious Tibetan text. 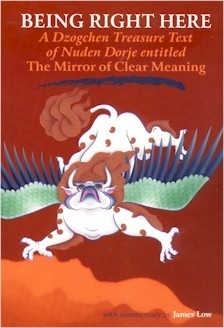 Anyone interested in the view and meditation practices of Dzogchen, the Natural Great Perfection teachings, would benefit from keeping this handbook close to their hearts and minds, as I myself do." -- Lama Surya Das, author of Awakening the Buddha Within and founder of the Dzogchen Center. "Being Right Here is a must-read for anyone interested in awakening the enlightened nature of the mind." -- Tulku Thondup Rinpoche, author of The Practice of Dzogchen and The Healing Power of Mind.